So, you've seen the last two episodes of hurricane/tropical storm Irene photos, and now I bring you the final chapter: How We Coped For 72 Hours Without Electricity. 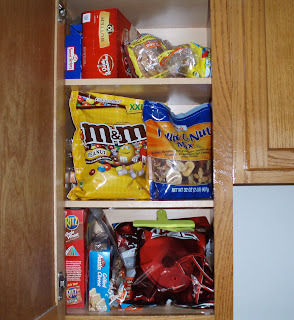 As you can see here, we were pretty well stocked with snacks. This is only a small portion of what we had on hand, and after all, when one has an apartment full of boys...one must keep the pantry stocked with Little Debbie snacks, lol. Trail mix and wheat Ritz crackers were for me. Once we were able to leave our homes again, I took Alex to school and had Dante with me, running errands to the bank and walmart for additional supplies. We had a charger that plugs into the car's cigarette lighter port. It has regular outlets and a USB port so we could charge our phones, Nintendo DS's and Dante's iPod touch. I didn't let the boys use the battery operated items until after 5pm when the light started to fade, and that way they had them when they really needed to have something to do, and no one's battery died in the middle of a game, in the dark. 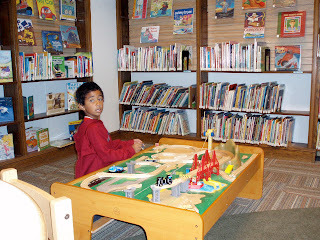 After Alex got out of school, we went to the local libraries so he could play and we could take advantage of power, internet, and air conditioning. We also keep up a steady supply of book for Alex to read. 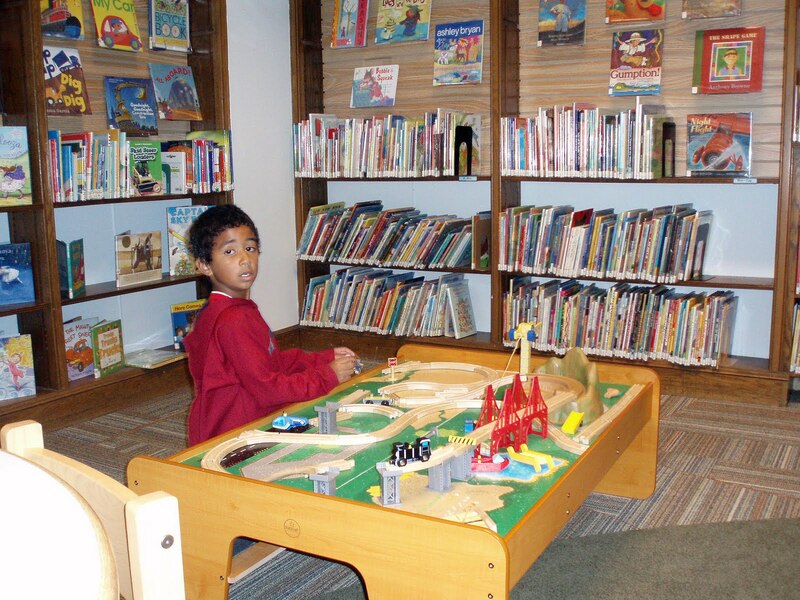 At the newly remodeled Weaver library in East Providence, we found this awesome train table where Alex played for about an hour, during which I was able to sit at a tiny table in a tiny chair and work on my final project offline. There were several rooms with cool things like a puppet theater, a funhouse mirror, a lego table, and a station set up for babies 1-3 years old. Dante went over to the teen section, found a beanbag chair, and read for a while. At some point in the day, Alex needed to go potty and when I took him into the bathroom in the children's section of the library, I felt like I was in Alice in Wonderland! Everything was child-sized! 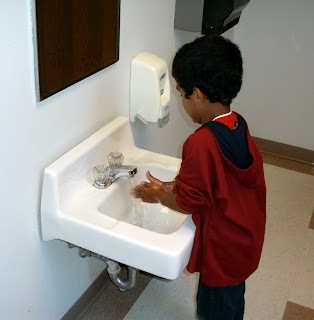 The sink was at his level. The mirror was low enough for him to see himself in it. 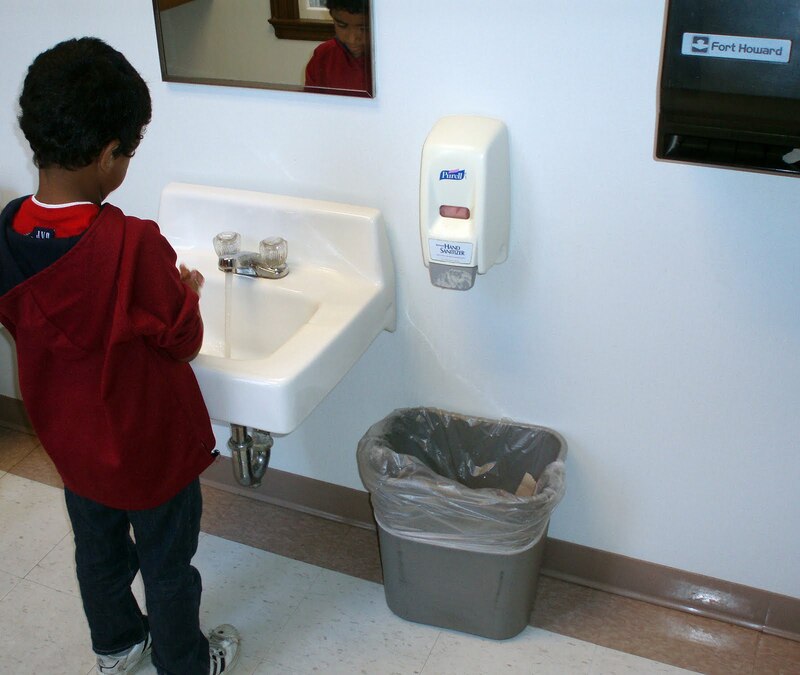 He could actually reach the soap dispenser and the paper towel holder. It was so cute, that I had to take photos of him at the sink, lol. Later in the day, we went home to add more ice to the cooler, eat lunch, and stock up on snacks again. Then it was off to the Barrington Library where we found half the town at the park with their children. Unfortunately I wasn't prepared for the icecream truck to randomly pull up out of the blue, and Alex was pretty upset that I didn't have cash to get him an icecream. That meant a trip to Riverside Creamery for a sub-par soft serve (because they take debit card). At least the boy was happy. Thankfully, the power was restored the day after this, so I have no more storm-related photos to show you. Hopefully I'll be able to show you some of the knitting projects I've been working on, in an upcoming post.